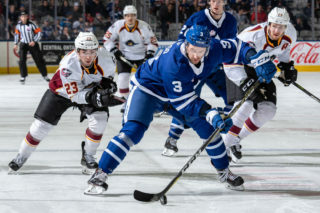 The Toronto Marlies battled back with a late goal in the dying seconds to force overtime and pick up a point Friday night in Rochester. Sam Gagner fired a blast from the blueline with just 10 seconds remaining to erase a 4-3 deficit, but ultimately the Americans won 5-4 in a shootout. Danny O’Regan scored the game’s first goal midway through the opening frame for Rochester, but Pierre Engvall answered back less than three minutes later, driving hard to the net and scoring off a great pass from Sam Gagner. Calle Rosen had the secondary helper on the goal. Alex Nylander scored in the final minute of the first to give Rochester a 2-1 lead at the break. 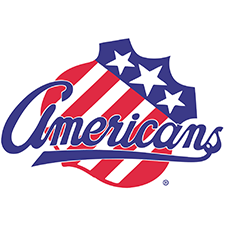 The Americans extended the lead to 3-1 early in the second off a Danny O’Regan goal but Dmytro Timashov closed the gap with a power play marker, finishing off some great passing between Chris Mueller and Carl Grundstrom. 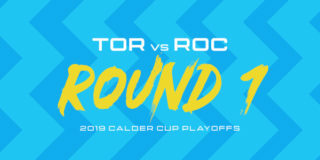 Rochester extended the lead to two goals midway through the second but the Marlies again carved into the deficit shortly afterwards as Grundstrom converted on the power play, battling in front of the net and banging home a second chance opportunity to make it 4-3. Timashov and Timothy Liljegren had the helpers. 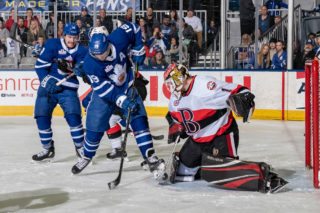 The third remained scoreless until the dying moments when, with the Marlies net empty, Gagner connected on the one-timer pass from Rosen and tied things up. Jordan Subban had the secondary assist. 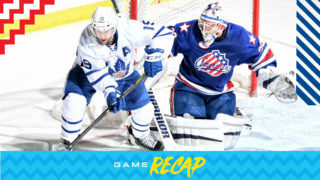 In the overtime period, the Marlies were sent to the box but managed to kill off the shorthanded situation and generate some chances in the extra frame, but ultimately the game headed to a shootout, where the Amerks converted on all three chances to pick up the win. Jeff Glass finished with 36 saves for the Marlies while Scott Wedgewood had 38 saves in net for Rochester. There’s little time to rest for the Marlies who head home to host Hartford tomorrow afternoon at Coca-Cola Coliseum. Pierre Engvall scored the Marlies’ first goal of the game at 14:08 of the first period. Engvall has five points (2 goals, 2 assists) in six games this season. Dmytro Timashov scored on the power play at 7:31 of the second period and later added the primary assist on Grundstrom’s second period goal. This is Timashov’s first multi-point game of the season. He has five points (2 goals, 3 assists) in six games this season. Carl Grundstrom scored on the power play at 14:49 of the second period and earlier added the secondary assist on Timashov’s power play goal. Sam Gagner scored at 19:49 of the third period and earlier registered the primary assist on Engvall’s first period goal. Gagner leaders the Marlies with eight points (4 goals, 4 assists) in six games. This was his third multi-point game of the season. Calle Rosen recorded the secondary assist on Engvall’s first period goal and later added the primary assist on Gagner’s third period goal. Rosen leads the Marlies with six assists. Chris Mueller had the primary assist on Timashov’s second period power play goal. Mueller has recorded a point (2 goals, 3 assists) in his last four games played. Mueller has three points (1 goal, 2 assists) on the power play this season. Timothy Liljegren registered the secondary assist on Grundstrom’s second period power play goal. Jordan Subban recorded the secondary assist on Gagner’s third period goal. Jeff Glass stopped 36 of 40 shots. Glass is now 0-2-0-1 on the season with a .865 Save Percentage and a 4.49 Goals Against Average. Toronto had a 42-41 edge in shots in all situations. 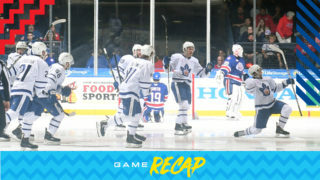 Andreas Borgman led the Marlies with seven shots on goal. 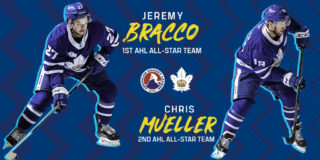 The Marlies are 1-4-0-1 against North Division opponents and 0-0-0-1 against the Rochester Americans. I thought there were some really good segments of the game for us. Obviously, our special teams were really strong for us tonight. So definitely some strides in the right direction. At the same time, there’s clearly still lots to work at here. We gave up way too much, way too many chances, way too many shots. There’s a lot of areas for us to continue to get better at. Coming in here against a very good team that’s rolling like they are and to stay with it and come back in the game, a lot of really good positive signs for our team that we’ll build on. This was a team that we knew coming in was going to challenge us in the neutral zone with how they transition, how they get their defence involved. We knew that coming in. I didn’t like how we dealt with that. That’s an area that I think we got exposed at tonight. I don’t think there was a whole lot of defensive zone play for us in the game to be honest. A lot of chance and shots came off the rush and off of entries. That was a focus for us through the week. To play against a team like this that does it as well as they do with the depth that they have and the speed that they have from the back end, it’s a real challenge. So, it’s one thing to practice it, one thing to talk about it and then it’s another thing to actually work your way through it so I think that’s the biggest area we’ll take away from this game in terms of how we failed to answer that bell. I thought he was excellent. … The two penalties in the third period are tough for both him and our team. I thought he had a lot of really, really good sequences, coming back and stripping guys, winning the puck, getting some changes, making some plays. For a guy that didn’t play any exhibition and in his first game of the season, I was just really pleased with what we saw from him. 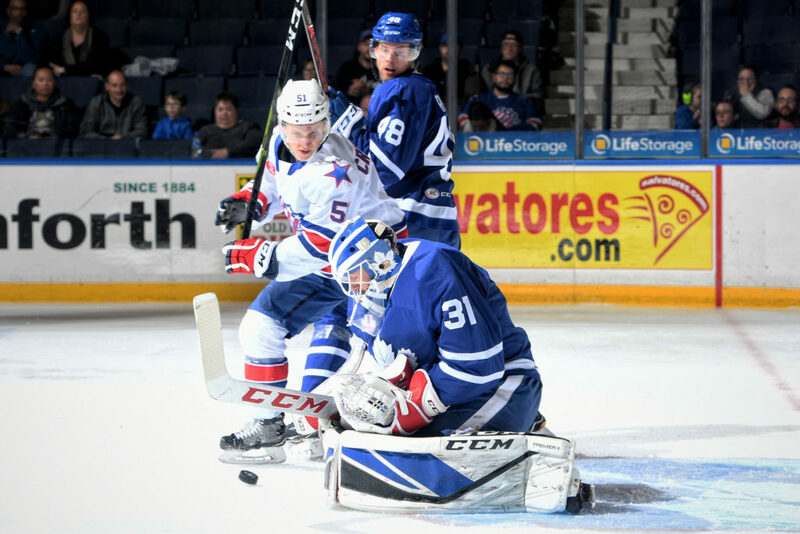 The Toronto Marlies are making a quick trip to Rochester Friday night for their first meeting with the Americans this season, looking to snap a tough streak of losses. They’ve had a week of practices and are looking to regroup and rebound when they hit the ice in Rochester. Since a decisive 7-3 victory on opening night, the Marlies have found themselves on the wrong side of four straight games. Three of those games were decided by two goals or less and the Marlies lit the lamp 15 times over that span. Holding the Amerks offense will be important to having success on the road tonight. At the other end, Rochester is riding a four-game win streak after downing the Comets 6-1 on Wednesday. Despite a 4-2-0-0 start to the season, the Amerks have struggled on home ice with both losses coming at home. Trevor Moore (4G, 2A) is leading the Marlies offensively alongside Sam Gagner (3G, 3A) who each have six points. Rookie Victor Olofsson leads the Amerks with 12 points (5G, 7A) while defenceman Lawrence Pilut has 10 (2G, 8A) on the season. Starting strong will be an important key for the Marlies tonight, as they’ve yet to lead at the first intermission this season. The Amerks have yet to lose when leading after the first 20 minutes. Puck drop for tonight’s game is scheduled for 7:05 and fans can catch all the action on AHLTV.